This hand held core drill can accommodate up to a 4" diamond core bit and is great for boring holes in concrete and assorted masonry. Side handle is included for added stability in drilling. This unit must be used with the provided water attachment, to keep cutting edge cool and free of debris. Bit rentals are charged separately, and vary according to size. 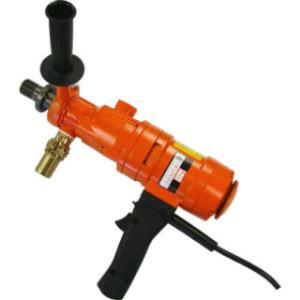 * Please call us for any questions on our core drill hand held rentals in Hillsdale and Ridgewood NJ.